We are currently in the 4th section and always ready to welcome new players into our friendly ranks. All you need is some experience of playing a brass instrument, or percussion. The band are looking forward to growing in number and developing their repertoire, whilst entering a few contests along the way in order to progress. If you play a brass instrument why not pop along and join us - we would welcome new players in any section. Please see Find Us for details. We rehearse at The old YMCA building, Claverley Drive, Warstones, every Thursday at 7:30pm. Please check out our Concerts page for details of this year's appearances and come and see us perform at a venue near you. If you would like to book the band for an event or occasion please see the Contacts page for information on how to do this. If you are a visitor to our website or a member of the band please feel free to leave a message on the Guestbook. We always enjoy hearing from people. 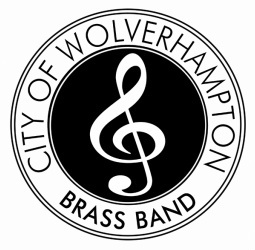 We are also on FaceBook as The City of Wolverhampton Brass Band. Please like our page for regular updates about the band. You can also follow us on Twitter using @WolvesBrass.